2 bedroom - The Brackett has been restored to its former historical uniqueness. It to has exceptional views of the harbor and all of the Moorings. It has a large living-dining-kitchen area, gas fireplace, two bedrooms (one double, one king), and bath. This level, by opening a connecting door, again unifies the entire building. The attached barn is part of the entire home and it can be used commensurate with additional family, an au pair or guests. Separate living quarters on the second floor completes the living space in this building, allowing for family expansion or private guest quarters. The second floor has its own entrance or accessed by a connecting door in the main quarters. The Bracket House has a total of 3056 Square Feet of Living Space. 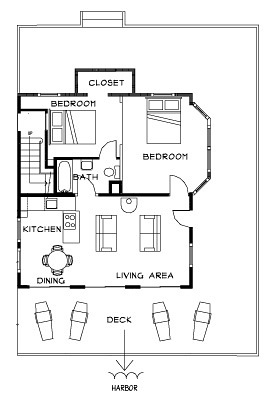 This area of the living space is 1035 Square Feet.